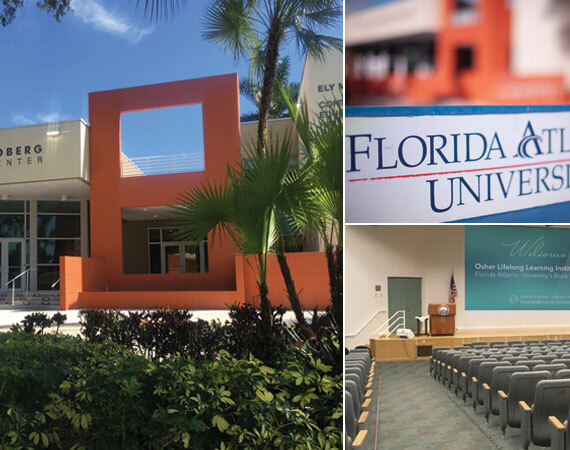 The FAU Osher Lifelong Learning Institute in Boca Raton seeks applications for series and program proposals for Winter/Spring 2020. Submission Deadline for Winter/Spring 2020: Wednesday, May 15, 2019. All proposals are reviewed and selected by the OLLI Boca Board of Advisors’ Curriculum Committee. Event Types: Four (4)-Week or Eight (8)-Week Series and/or a One-Time Event. Presenters may apply for multiple events or programs on different topics. Program Length: One-Time Events and each session of a series are typically scheduled for 90 minutes once each week, although two hours may be accommodated. Audience: Non-traditional adult learners, many of whom are college or post-college graduates. * See the current program list for example topics being presented. Compensation: Compensation is based on student enrollment numbers. Note that in addition to the amounts in the following chart, for every multi-week series there will be a $4 compensation for each guest ticket sold. Presentation Materials: While not required, presenters are strongly encouraged to supplement lectures by using visuals such as PowerPoint slides, or other media. Barry and Florence Friedberg Auditorium. Capacity: 500-seats. Ely Meyerson Continuing Education rooms. Capacity: two 60-seat spaces, or one 120-seat space. Program Description: The focus should be on a general description of materials to be covered, and objectives and outcomes of your series. The detailed description should accurately reflect the program/presentation content. Max. words 150. Lectures: Include a brief title. Biographical Information: Include professional experience, activities and awards/honors, training, etc. Max. words 170. Equipment Request: Please indicate use of slides, CD, DVD, overhead projector, PowerPoint, or any other media. Note that decisions about program proposals that require extensive editing and revisions may be deferred to a future term. New Presenters: Please create an account in the Instructor Resource Center. Established Presenters: If you have previously submitted a proposal in the online system, please do not create a new account. If you forgot your login information there are tools on the login page to help you retrieve it. As part of the application process, presenters may be asked to submit a current CV. Instructions on how the CV should be submitted will be provided as needed. New, prospective presenters may be asked to provide a lecture sample, either via the web or a recorded version, as part of the application process. Our program evaluation committee takes into consideration whether the lecturer/entertainer can also be seen at other competitive venues; FAU faculty, new presenters and those who offer programs exclusively for us will be given preference. If you have any questions, or need assistance, please contact Judith Scara at jscara@fau.edu.